Residents living near Bristol Prison in Horfield have welcomed its recent downgrading. The jail, which houses more than 600 inmates, is changing from category A to category B, meaning it will house less dangerous criminals. The category A status was only awarded in the last five years, and the prison has had problems with overcrowding in the past. Clive Broom, deputy governor at the prison, told BBC Radio Bristol: "It was a national decision by the prison service, which wanted to move category A prisoners into fewer high security establishments. "I can't talk specifically about security, but the public will not see any major changes and should not be concerned>"
Bristol's category A prisoners have been dispersed around the UK. 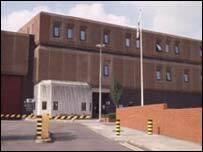 Although the majority of residents polled by the BBC were happy with the decision, some added that the prison made no difference to their lives, regardless of its category.